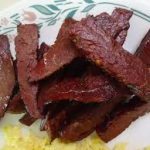 Hawaiian beef jerky is moister than it's mainland counterpart because it's cut thicker into larger strips. It has a unique taste and is great for an appetizer or on your buffet table on game day! This is another dish that would work with a low carb diet. In a glass or ceramic bowl, add the last 5 ingredients and toss the meat strips until well covered in the bowl. Let it marinate, covered, in the refrigerator over night. In the morning, flatten the strips slightly and sprinkle with the kosher salt. Let stand, covered loosely, for 30 minutes. Arrange strips 1-inch apart on a cookie sheet covered with parchment paper. Place in a preheated, 200 degree F. oven for about 5 or 6 hours, turning the pieces over every once in awhile, or until the meat is firm to the touch. Remove and let rest until completely cooled. The meat can be eaten immediately or covered and stored in the refrigerator. FoodForYall.com is a participant in the Amazon Services LLC Associates Program, an affiliate advertising program designed to provide a means for sites to earn advertising fees by advertising and linking to FoodForYall.com. Each of your purchases via our Amazon affiliate links supports our cause at no additional cost to you. Thanks for your support.